“Golden Hour” ends early on midsummer mornings, and I’m not the morning person I used to be (especially during vacation). So when we’re off boating, the embarrassing reality is that by the time I’m ready to set out in my kayak or dinghy for a paddling excursion or a walk ashore, I’ve usually missed those glorious opportunities to capture nature in the soft light of early morning. But occasionally I get lucky. Early one recent morning, a skein of 21 Canada geese (including the trio in the photo above) flew into our anchorage, landing close beside our boat. It was Golden Hour, and here was nature right in front of me, ready for my camera: my favorite way to start the day. 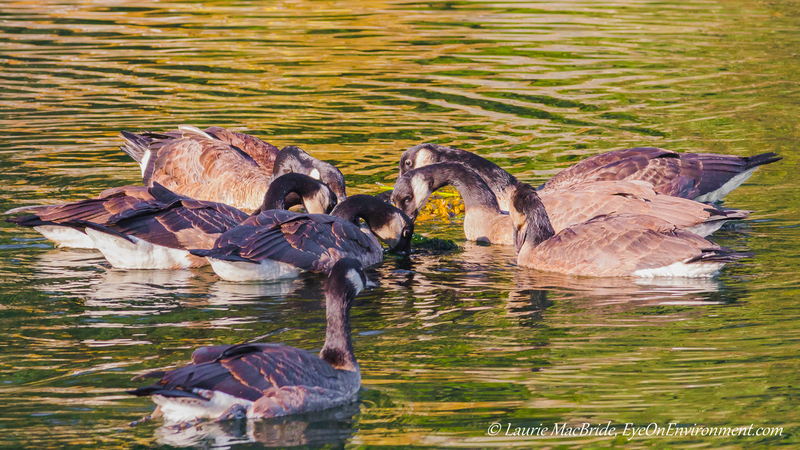 The geese stayed for a lengthy time, paddling slowly about the anchorage and stopping every now and then to share a breakfast of floating seaweed rafts (see below). I sat in the cockpit, sipping my first cup of java and watching the paddlers, who passed close by several times. The soft light around them was augmented by the reflected colours of the trees along the shoreline, making the morning seem like pure gold. Breakfast Buffet: soon, all the rafts of floating seaweed had been cleaned up. A final reminder of my photography show, “Inspired by the Coast”: 35 marine and nautical images of the BC coast, on display as mounted prints (available for purchase), at Silva Bay Restaurant & Pub on Gabriola Island. Ends September 7, closing day for the restaurant & pub. 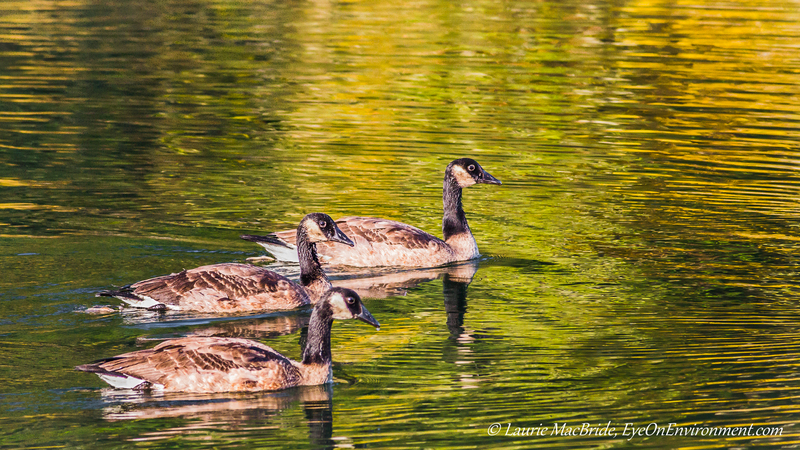 Posted by Laurie MacBride, Eye on Environment on August 24, 2014 in Animals & Wildlife, Birds and tagged animal behavior, boating, Canada geese, colours, feeding, golden hour, light, magic hour, nature, photography, photos. So sorry I can’t make it over to Gabriola. I’m so pleased that you’ve had such great exposure and hope there are smart people who are purchasing your lovely images!